We’ve made a couple of improvements to the way students enter their responses through the Student Portal. These updates will be live Tuesday Oct 10, 2017. When students click START to open an online answer sheet they will now see this screen, asking them if they want to type in their answers or select them by taping/clicking on-screen buttons (this is the way we’ve always done it in the past). 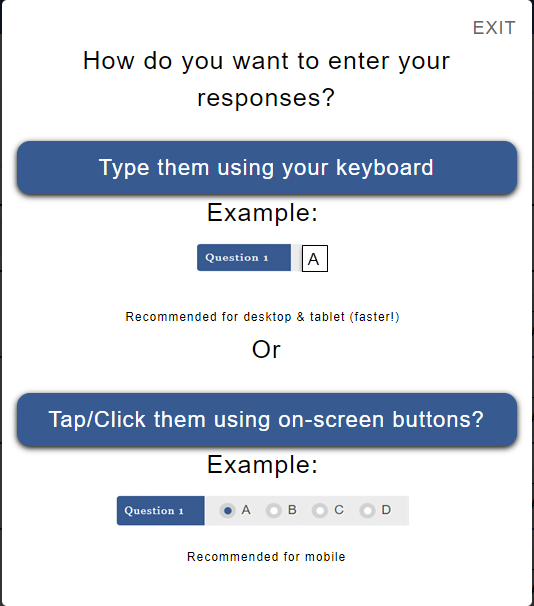 Students can then type in their responses into the ACT, SAT/PSAT online answer sheets. Each field will only allow a valid letter responses, i.e. for ACT English all odd questions allow only A,B,C, or D and all even questions allow only F, G, H, J. Students can enter a capital letter or lower case letter. As soon as a letter is entered, the cursor advances to the next field. This makes for super-fast data entry for those students who only use the online answer sheets to transfer their answers from a paper answer sheet for online grading. The same speed improvements were made recently to the manual data entry forms on the Admin Panel. One of our customers commented to us recently that it would be useful to have a SUBMIT button at the bottom of the answer sheet. He’s obviously right. Sorry, we didn’t think about that ourselves. So from now on, no more scrolling to the top of the answer sheet when students are ready to submit their answers. BTW, the mobile version of this screen has the submit button persistently at the top, so this was a (needed) change only when accessing the online answer sheet from a desktop device.